If you’ve ever spent an afternoon idly watching HGTV, you know the appeal of seeing a home come together, going from dilapidated wreck to chic living space. The one bummer about it is that doing it in real life requires a lot of physical labor. 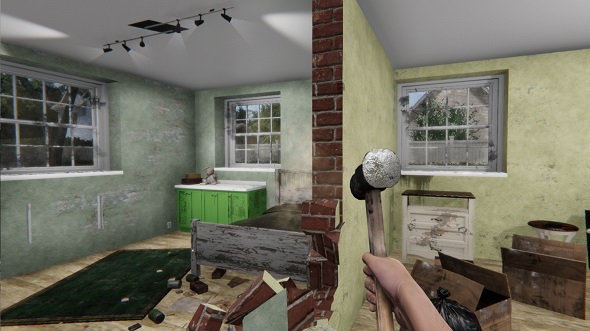 House Flipper, out now on Steam, gives you the satisfaction of being a Property Brother without all the muscle cramps and stubbed toes. The game has been an under-the-radar darling of Steam’s Early Access and Greenlight programs for some time now, with prominent YouTubers dabbling in renovation here and there. Now that the full release is out, it’s gaining popularity quickly, and is currently sitting at number one on Steam’s top sellers list. Here’s our list of the best building games for the PC. As you might expect, the goal is to clean and renovate homes and then sell them for a profit, and it gives you quite a few tools to work with. You’ll have to start out by doing simple jobs for homeowners, like cleaning up after messy tenants, or painting over obnoxious color schemes left by the previous occupants. Once you build up enough savings from doing odd jobs, you’ll be able to buy your own houses, which is where the real fun starts. You can use a sledgehammer to knock down drywall partitions, replace electrical outlets and plumbing fixtures, and completely refurnish your properties as you see fit, selling old furniture and adding new lighting schemes. Some of the places you’ll walk into are real disaster areas, and fixing them up feels genuinely satisfying. It’s a surprisingly tranquil experience, and much less of an investment in terms of time and money than doing the actual job would be. If you’re interested, you can check the game out on Steam.